A series of 4 paintings each measuring 130 x 97 cm using the medium of acrylic on canvas. 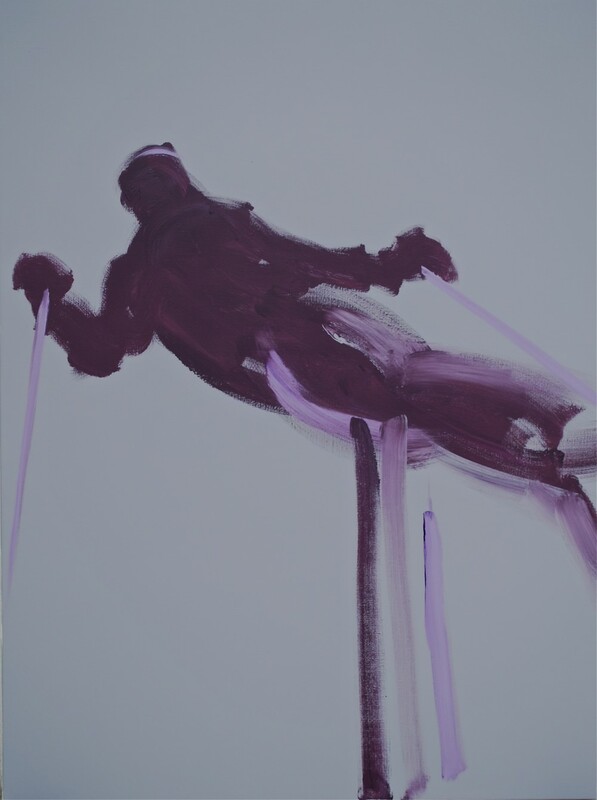 The series continues the theme of exploiting the dynamic figure as a vehicle, but emphasizes the use of quirky and tricky colour combinations. Each piece was conceived as a individual painting, but which, when viewed together, would result in some interesting juxtapositions. The pre-requisites for each painting were – the figures should be large and imposing – the palette must be restricted – any lighter parts should not contain pure white and remain quite low, so pushing neutral and bright colours to their limit. Facets. Initially, I wasn’t thinking about the modifications to light and image resulting from facets of cut stone or crystal etc. As the work progressed I thought about where I was actually drawing these colours from and started to compare it to “voyaging” through a series of “facets” of refracted light. Back lighting. I’ve spent much time observing the light in the high alpine dusk transiting to nightfall during snow cover. 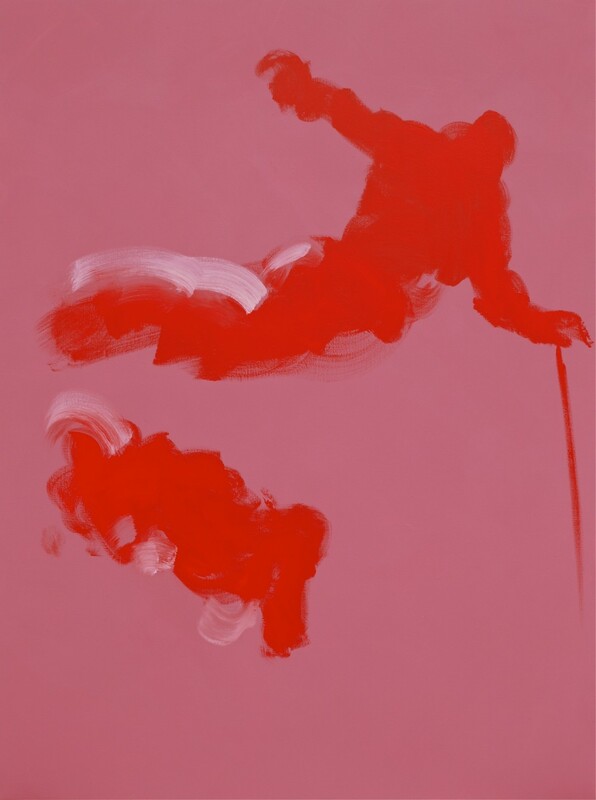 As sky becomes slope and slope becomes sky, the multiple variants of hues and specifically in the case of these works, reds, blues and violets, seem to flatten out forms and make things appear to be dense and print-like. A phenomenon of “back lighting” is partially responsible for this. A slope which is already in deep shadow can receive a glanced reflection from one that is still catching the sun. SHIFT. The “tricking” of close colour relationships was key to obtaining this mysterious result. To the eye the colours appear to be almost blue even though much violet paint was used in their mix. 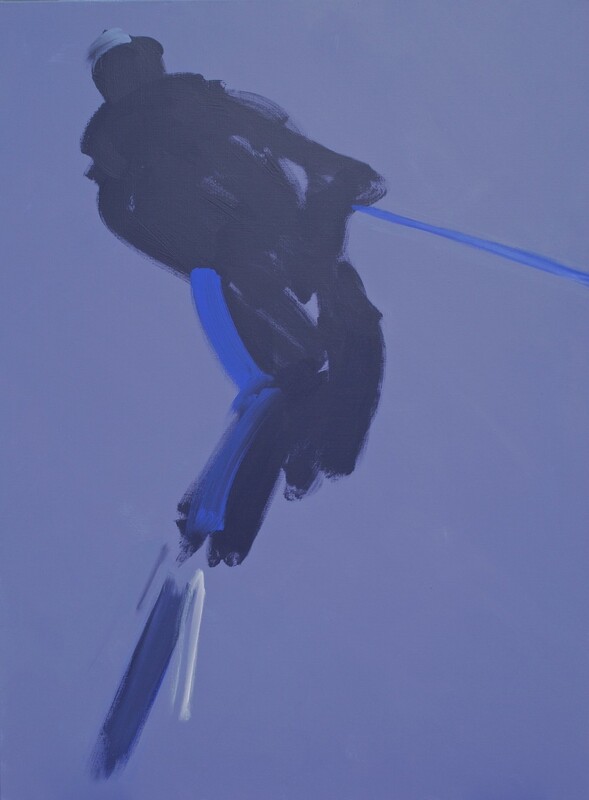 When painting the wide bright blue-violet line, the brush literally vibrated in my hand- a great feeling – like hearing a rich “suspended” chord in music. BURST. I was interested in pushing the purposeful and blistering bright red even further towards the heat zone. I wanted to achieve this by setting it off against a strange, neutral pinkish background, which contained just enough blue and grey to make the figures seem to “burst” off the surface. A shoulder in a red ski suit, with a winter sunset behind, may simply have been reason enough to excite my internal colour wheel. SWIPE. A breathy, mauve light hovers briefly before the blue end of the spectrum starts to dominate completely, signalling the onset of night. 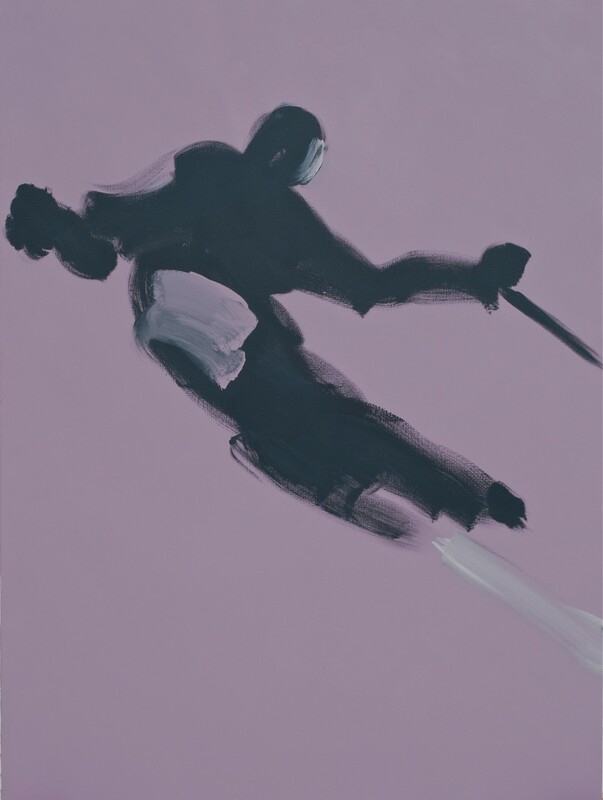 The figure appears to be fleeting across a flattened, rapidly diminishing colour field, but it still penetrates like a sharply silhouetted rock, implying that perhaps behind it there is an early rising winter moon. IRIS. A fused, swivelling figure, flickers on a matt vacuum-like, grey background. In low light conditions it is hard to discern whether a figure is approaching or receding, and the loosely painted vertical stripes used here, serve to perplex even further, giving no definite clue. I used the prismatic light violet to represent the mind’s imaginary colour as if it were trying to draw around and underpin the composition.